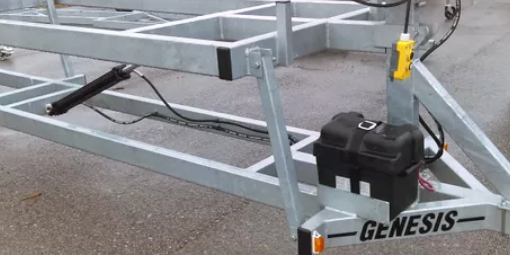 Genesis Crank Up Pontoon trailers feature an all welded hot dipped steel galvanized frame, single or tandem axle, submersible lights, and marine carpeted bunks. Pontoon trailers are available for pontoon boat lengths from 10' to 28'. Electric and hydraulic brake options available for single or tandem axles. Get your pontoon boat in and out of the water simply using a Genesis Pontoon trailer. Built heavy-duty for years of reliable service.